Happy Halloween! We are so excited to introduce a new weekly feature at SASI - Our Friday Friend. We look forward to showcasing many of you SASI stampers in the coming weeks. And for the very first Our Friday Friend the honor goes to Rachel Sztonyk, gingerbread-gal on SCS. Her delectable screen name may have given her a bit of an advantage with the sweet-toothed SASI team, but ultimately it was her Trick or Sweet gift bag and display of handmade chocolates that won us over. Not only is the bag (using Bakers Dozen member Jen del Muro's sketch) adorable, but I mean, handmade chocolates...hello? How do you get past that? Rachel's SCS gallery is filled with darling creations - check it out here. And you'll also want to hop on over to her blog gingerbread gallery (very clever name!) and show her some love! Taylor conducted a little interview with Rachel so we could all get to know her better. I became addicted to papercrafts when my friend invited me a Stampin' Up! Workshop. I saw the demo and wanted it ALL! I have been stamping for about 5 years now and loving it! I would describe my style as cutesy and that is why I am so drawn to Stamp a Sweet Impression Stamps. All the images are so CUTE! 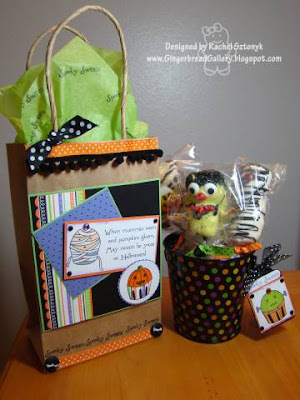 My favorite projects to create are treat bags and boxes. My mom started me off making treat bags on every holiday for classmates since as far back as I can remember. I am still doing this today for friends, family and co-workers. I am so excited because I get to pass out Halloween goodies today! This is a tough question! Can I pick 2? I would definitely have to say the Gingerbread House from the Home Sweet Home set because I couldn't be a Gingerbread Gal without that as a choice. I would also have to pick the Cuppy image with the tongue sticking out from the Sweet Celebration set as my other choice. I often do the same thing when I am stamping, so it just cracks me up! My favorite sweet treat is Peppermint Bark. I hand this out every year for Christmas. The recipe is simple and sweet. The best part is that it is so fast to make and also a big hit with everyone. Recipe: Place a sheet of wax paper over a cookie sheet. Double bag a Ziploc bag, add unwrapped Peppermint Candies and close. Place a paper plate underneath the bag and crush Peppermint Candy filled bag with a hammer. I like my pieces small, so I keep hammering until my pieces are to the size I like. Melt Chocolate in a microwave safe bowl as directed on packaging. Once the chocolate is melted add scoops of crushed peppermint to your taste and stir. Now spread the chocolate mixture evenly over the sheet of wax paper and place in the fridge. It will only take about 5 to 10 minutes for your chocolate to set. Once set you can just break apart the sheet of chocolate into pieces and there you have it ~ instant Peppermint Bark! --What is your favorite Halloween costume that you've worn? My favorite costume would have to be the Bumble Bee Costume my mom made for me when I was 3 years old. It had a huge stinger that looked like a big carrot. LOL! Thanks so much Rachel for being Our Friday Friend and for sharing a bit of yourself with us today! And how about you - would you like to be Our Friday Friend? Each week Taylor will scour the Taylored Expressions Company Gallery at SCS for recent uploads (within the past 10 days) in search of a SASI Stamper to be featured on this blog.To be considered all you have to do is:**Create something (card, 3D item, scrapbook page, anything) using one or more images from any SASI stamp set. Your creation should showcase SASI, but does not have to be exclusive to SASI. Cupcake Friday - hop over to Taylor's blog to see the sketch and play along! Candy Dots are back in stock at TE the store! Boy oh boy - those Candy Dots flew off the shelves - especially the pink and red ones. They're all back in stock now - click here to get some now! Congratulations Rachel! What an adorable set. . .I just LOVE it! Congrats, Rachel! This is so stinkin' CUTE! CONGRATULATIONS, Rachel! Totally adorable project...and oh my word, homemade chocolate? Awesome! Congratulations Rachel! That project is filled with WOW factor! Congratulations! This is a very cute gift set. I love it!